Christina apartment, fabulous sea view, minutes from the beach. 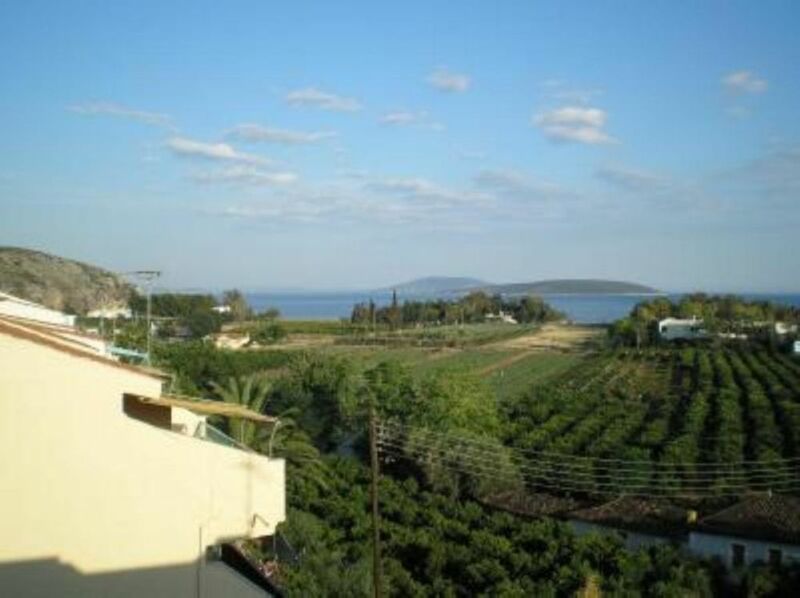 The apartment is placed in a peaceful location on a hillside, surrounded by citrus trees, 300m from ‘Plaka’ beach. There you can swim, sunbathe or do water sports. The apartment is also, just 5 minutes walk, away from the centre of the village, where you can do your daily shopping. From the spacious balcony, you can have your meals and enjoy the wonderful view to the sea and the area. It’s the perfect place to relax and enjoy the Greek summer. It is ideal for family vacations or for couples. It is fully air-conditioned and has its own kitchen. The kitchen is fully equipped –so it’s easy for you to prepare your meals. The apartment is in Drepano, Argolida, just outside the beautiful town of Nafplio (9km away). Situated in an ideal location allows you to explore the most well-known and exciting sights of Greece. We had a very pleasant stay at Christina Apartments. There is a beautiful view of the water and it is centered among lush orchards. The town is nice with good restaurants and convenient markets. Maria is an excellent hostess. We recommend staying here to everyone. Excellent accueil de Maria et de sa famille. L appartement est superbe, la terrasse que nous avons beaucoup utilisée se trouve face à un champ d orangers. Location que nous recommandons donc vivement. Nous reviendrons ! Drepano è un luogo lontano dal turismo di massa, frequentato per lo più da greci, con una spiaggia bellissima e un mare incontaminato. Il paesaggio agricolo è una cornice incantevole. In ottima posizione, ci ha permesso di fare una vacanza riuscendo ad alternare perfettamente mare e visite a tutti i siti archeologici del Peloponneso, a Sparta, Olimpia, Atene, Corinto, ecc. L'ospitalità è stata perfetta e per questo ringraziamo i padroni di casa. Abbiamo trascorso due settimane greche indimenticabili, anche per il nostro cane che è stato accolto dappertutto con il sorriso. El apartamento no es una maravilla, pues está un poco viejo, pero es suficiente para pasar unos días en un pueblo tranquilo (no demasiado turístico) con una playa apacible. Lo mejor de todo, sus propietarios: no nos ha faltado de nada y el trato ha sido inmejorable. Tuvimos problemas con nuestro coche y nos ayudaron en todo para poder repararlo y continuar con nuestro viaje. Son un encanto. L'appartement est idéalement situé, proche de la plage et du village. La kitchenette est un peu petite, mais comme la famille Papandrianou est extrêmement serviable, on oublie vite ce léger désagrément. "appartamento pulito, ben tenuto anche se i mobili sono antichi ma bn funzionanti. La casa è a breve distanza dal mare e con vista mare. Appartamento fresco anche se dotato di aria condizionata in tutte e due le camere da letto. Ha una bella terrazza con tenda antisole dove poter mangiare comodamente in quattro. Presenta un buon parcheggio sottocasa per l''auto. Si trova a breve distanza, pedonale dal centro di drepano. Noi abbiamo utlizzato il soggiorno a drepano per visitare nauplio (un bellissimo museo archeologico); micene, tirinto e abbiamo fatto una puntata ad atene (circa 90 minuti di viaggio).E'' necessario un auto per girare e godere delle bellezze della zona..."
From Athens International Airport ‘EL.VENIZELOS’ to Drepano is 160 km. There is a regular bus service from airport to the central bus station of Athens (KIFISOS). From KIFISOS BUS STATION, there are regular buses (every hour) to Nafplio. From Nafplio you can get a bus to Drepano or a taxi (it’s only 10 minutes drive). If you rent a car from Athens estimate a travel time of about 2 hrs to come to the apartment. Drepano is located in the south west of Argolis in the Peloponnese. It is a peaceful seaside village, which combines the endless green colour of the citrus trees and the beautiful beach of Plaka. The hillsides are full of plants and herbs. It is well known for its traditional taverns. You can also find café and beach bars where you can enjoy your drink or coffee. You can find everything you need in a short walk from the apartment (grocery stores, butcheries, bakeries and food markets). It is near Nafplio, a beautiful town (which is the capital of Argolis, and the first capital of Greece).The old city of Nafplio has been preserved and you can enjoy your walk in it enjoying the old houses and the small traditional shops. The most famous historical monuments of the area are situated nearby. The ancient theatre of Epidaurus (30km) where at summer you can enjoy classical ancient plays (drama festival), the archaeological site Mycenae(30km), the Cyclopian Walls of Tyrintha (12km) and Athens (150 km).